My kids still get a craving for those crunchy-fried fast-food style "Fish Fillet Sandwiches" every now and then. Even though this wasn't ever something I personally ate, I think we've managed a pretty good (and much more healthy!!) substitute, especially since the fish-eaters said they really like it! The idea sorta came from Jennifer and her "Vegan Lunch Box" cookbook, but over time, I have since altered it to suit my family and the ingredients we prefer. Combine dry ingredients, EXCEPT cornflakes, and blend on high in food processor or blender until most of the almonds have been turned into a coarse meal, with a few larger pieces of almond remaining. Crush cornflakes in a plastic bag (until they're in very small but not powdery pieces) Add to dry mix. Stir. Pour the mixture into a wide baking dish or pie plate. Mix soymilk, Veganaisse and lemon juice. Pour into another shallow dish. 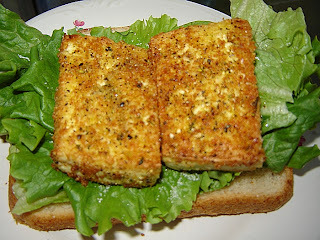 Cut the tofu into even slices (or "sticks") just under ½-inch wide. Working with one piece at a time, dip the tofu into the soymilk, then toss gently in the dry mixture to coat evenly. Fry in a non-stick pan with a bit of olive or coconut oil. Brown on one side and turn carefully, brown remaining side and sprinkle with lemon juice. Place tofu pieces baking sheet. When all the tofu fish are on the baking sheet, sprinkle them with olive oil. Bake for 15 minutes, then turn the tofu fish over and bake for an additional 15 minutes, or until crispy. Serve with lemon and vegan "tarter sauce" or in a sandwich. great idea! i was never a seafood/fish gal pre-vegan days but this sounds yummy. i rarely coat tofu in cornmeal and i really should start. Like PPV, I was never much of a fish eater as an omni. I've got to say I tend to really enjoy recipes like Tofishy sticks or "Not Tuna" salad made with chick peas and Old Bay seasoning. Thanks for reminding me of this recipe. I've got some tofu in the fridge that needs to be used up this week. Yum- thanks for the recipe! I think I'll make these for lunch right now. ok I'm back! I just made these for lunch (with a few small changes because of what I had on hand) and they were EXCELLENT! WOW. Daiku and I are licking our chops- I'll be sure to blog about these soon! Wow, I really miss those Filet-O-Fish sandwiches from McDs... I'll have to try these! Now can you help us make the supremely unhealthy planks from Long John Silver's? Tofu Mom, this is such a great idea! My husband really missed "fish and chips" every once in a while, and this looks like a great substitute. I can't wait to try these on him and see how happy they make him! These are really tasty. You're right about frying them. I baked some to compare, and as much as I wanted to like the baked ones, the fried ones were just so much tastier! I have to tellyou, I've been on your blog, since yesterday and I've printed out many of your recipes...my God, delicious! I live in France, and we don't have many vegetarien or even less végan things...and your blog juste gives me craving, hihi. I'll probably be trying out most of your stuff this week! thank you so much!!! I've made the "fish" sticks from the Vegan Lunchbox a few times, but these are "fish" sticks knocked up a notch or two. I'm printing off this recipe and trying these for sure. Thanks! I must make these because I used to love love love a fish fillet sandwich! thank you! puts out nice recipes! I tried the Tofu fish sticks yesterday, and they were very good. I didn't slice the tofu thinly enough, though. Next time I will do so, as well as maybe double the breading mixture. All I know is that i will be making these again. One question; can you freeze the leftovers? It's only me eating them, and I can only eat one or two at a time. Thanks and keep on cooking! I just linked over from "Where's the Revolution"- so glad I did! I'm having trouble getting my 2 & 1/2 year old to eat anything other than fruit and tofu-dogs, and was looking for something that reminded me of the comfort food my poor mom tried to get us to eat as kids...thank you so much for sharing! I'm totally linking your blog- I know I'll be back again for other inspiration/ideas!